Lynn and Bud in a scene of "L.A. Confidential"
Tomorrow marks what would have been the 92nd birthday of actress Veronica Lake. I can’t hear the starlet’s name without thinking about the movie L.A. Confidential and Kim Basinger’s Oscar-winning portrayal of Lake look-alike Lynn Bracken. And I can’t think about Lynn Bracken without picturing the gorgeous Spanish-style dwelling she called home in the noir classic. My mom fell in love with Lynn’s residence upon first seeing L.A. Confidential in the theatre in 1997. When my family moved from San Francisco to Los Angeles three years later, she informed our real estate agent that she wanted an “L.A. 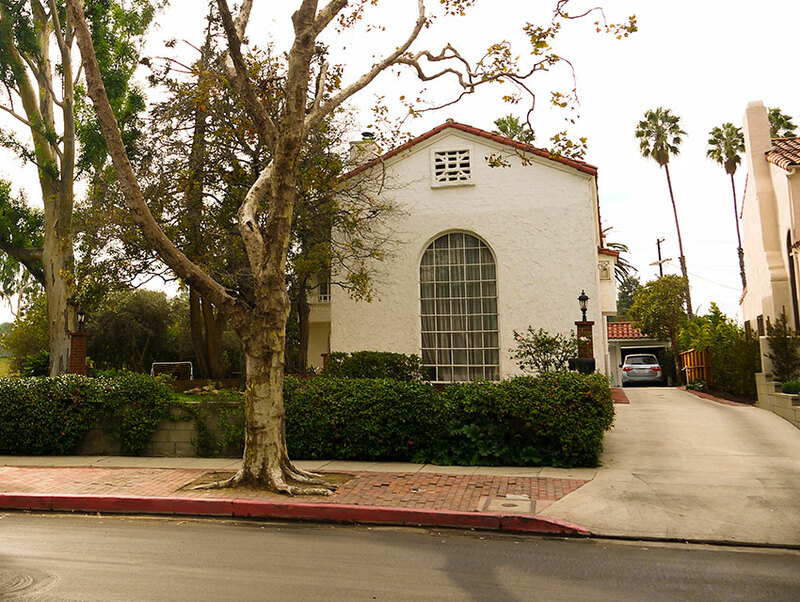 Confidential house,” and our agent promptly drove us straight to Pasadena and through its large concentration of 1920s-era Spanish-style bungalows. My parents did end up buying a home in the Crown City, one that looked very much like Lynn’s, although on a smaller scale. It is still my favorite house that I have ever lived in. While our real estate agent’s assertion that we would find what we were looking for in Pasadena was correct, ironically, the residence featured as Lynn’s in L.A. Confidential is located elsewhere. The property can be found at 501 Wilcox Ave. in Hancock Park, directly adjacent to the Wilshire Country Club. The stately 3,812-square-foot abode, which you can see historic photographs of here, was designed by silent film actor/architect Jack Donovan in 1923 and is known as the John C. Leavitt house. The dwelling’s façade was modified quite a bit for the production. In real life, the residence has an open-air front porch that was, for reasons that remain “off the record, on the QT, and very hush-hush,” enclosed for the shoot. 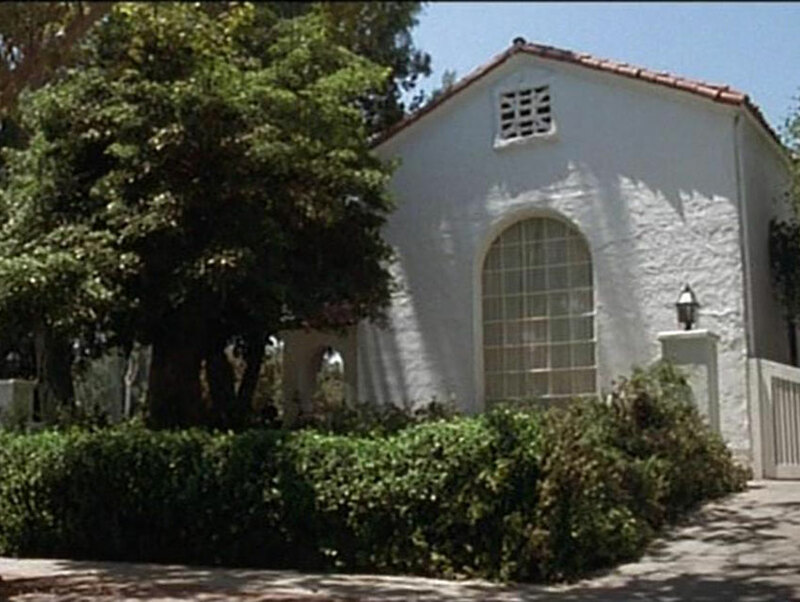 The fake canopy entrance significantly changed the appearance of the house onscreen and, though still recognizable, it looks quite a bit different in person. In fact, the first time I visited the pad, I thought I was in the wrong place. The home in November 2013. The property’s actual interior, with its large arched wall openings, wrought iron staircase, stucco fireplace, and two-story living room, was also featured extensively in the movie. Its exquisite design coupled with Lynn’s flowing satin gowns made for some idyllic silver screen imagery. Though L.A. Confidential focused on Los Angeles’ evil underbelly, the movie—and its locations—had the power to make audiences (namely my mom) fall in love with the place. Therein lies the magic of the City of Angels: Even in deep darkness, her allure shines through.